Effects of long WNK1 on ROMK1. (A) Long WNK1 decreases surface abundance of GFP-ROMK1 via a dynamin-dependent mechanism. Surface abundance was measured by biotinylation assays. Equal expression of the total ROMK1 in transfected cells was confirmed by Western blot analysis. Expression of Myc-tagged full-length long WNK1 and dynamin-2 (WT or dominant-negative; DN) was examined by an anti-myc antibody. The molecular size of proteins is shown. (B) Knockdown of endogenous long WNK1 by siRNA (top) increased surface abundance of ROMK1 (bottom). HEK cells were transfected with GFP-ROMK1 alone. Control oligo, control oligonucleotides. (C) Validation of the integrity of biotinylation assay. Cells were transfected with GFP-ROMK1 and incubated with or without biotin before lysis. Biotinylated proteins were precipitated by streptavidin beads. HC, heavy chain. 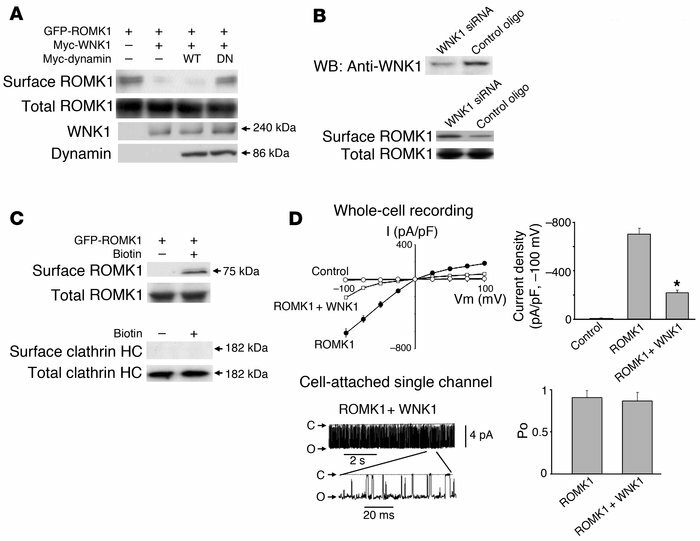 (D) Effects of long WNK1 on whole-cell and single ROMK1 channel activity. Top left: Current-voltage relationship of whole-cell ROMK1 currents. Top right: Long WNK1 decreased whole-cell ROMK1 currents. Bottom: Long WNK1 had no effects on single-channel conductance (at –100 mV) or open probability (Po) of ROMK1. Open probability was measured based on approximately 15 minutes recording from patches containing 1 active channel. *P < 0.05 vs ROMK alone. C, closed state; O, open state.